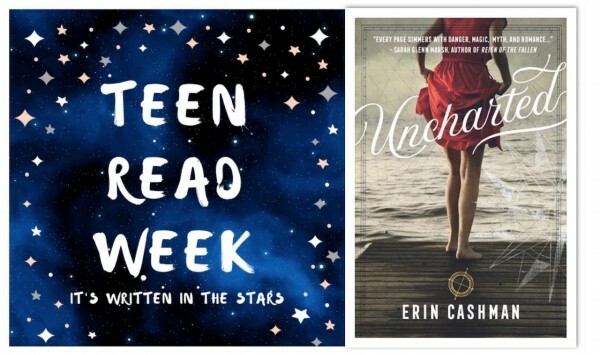 Teen Read Week 2018: Author Chat with Erin Cashman (Uncharted), Plus Giveaway! Read on for more about Erin, her novel, plus a giveaway! Erin Cashman is an award-winning writer of Young Adult fantasy. Uncharted released on September 4, 2018, and her debut, The Exceptionals was named a Bank Street College of Education best book of the year. She lives in Massachusetts with her husband, three children, and their very energetic dog. When she’s not writing, you can find her reading (of course! ), walking her dog, hiking, watching TV with her family, and running the 1st 5 Pages Workshop through Adventures in YA Publishing. She loves to bake and is known for making her family and friends ugly but yummy birthday cakes. Seventeen-year-old Annabeth prefers the fantasy of her books and paintings to reality―because in reality, her mom is dead, and it was all her fault. She vows to make her dad’s life easier in return. But upon accompanying him to his friends' secluded manor, he goes missing in the woods. Annabeth fears her father isn’t lost, but rather a victim of something sinister. She launches her own investigation, tracing clues that whisper of myth and legend and death, until she stumbles upon a secret. One that some would die to protect, others would kill to expose―and which twists Annabeth’s fantasy and reality together in deadly new ways. I read widely as a teen—and I still do! I fell in love with Shakespeare in eighth grade when we studied A Midsummer’s Night Dream, and I went on to read (and watch) most of his plays. I also loved fantasy, science fiction, and magical realism, which are still favorite genres of mine. I was fortunate that my high school had a wide selection of English courses, and I was able to double up on English—taking some as electives. Sci-fi and fantasy was one of my favorite classes, as it introduced me to so many of the greats—Ray Bradbury, Ursula K. Le Guin, Frank Herbert, George Orwell, Kurt Vonnegut, to name just a few! YABC: What book that you read as a teen had the most impact on you in your life? Lord of the Rings. A friend gave me the trilogy when I was fifteen, and I read all three books in a matter of days. I pretended I was sick so I could stay home from school! (Not that I’m recommending that!) I became completely immersed in the world and felt as though the main characters were all my friends. I hated to see the story come to an end! Lord of the Rings inspired me in so many ways, but particularly in my writing. I came to realize that readers will go on any journey with a character—even a flawed character—that we love. I love YA literature, both as a reader and as a writer, because often the books involve change, journeys, and choices. Annabeth, for example, must decide what kind of future she wants for herself in Uncharted, and it isn’t the future she thought she wanted at the beginning of the novel. I also love that, for many teenagers, the future is full of possibility. YABC: What advice would you give teens who might want to be a writer? First, to just keep at it and don’t give up! Second, read, read, read. But read slowly, pay attention to cadence, character arc, setting, etc. Third, look into the many wonderful, and free, opportunities for writers—from pitch contests, to workshops. I am the coordinator and a permanent mentor of the 1st 5 Pages Writing Workshop, which is a great opportunity for writers to have their pages critiqued by other writers and a literary agent. (You can read more about it, here!) Fourth, find a writing group or a critique partner you trust, and listen to their advice! The magic often happens in the revisions! What a lovely cover. This storyline will capture your YA readers immediately. I look forward to this novel. I NEED THIS BOOK!!!!! The cover is haunting the synopsis is intriguing and the its the book ill be needing! I really love the way the cover flows and I can't wait to read this book! The plot sounds like a great thriller but the cover doesn't seem to match the plot. The cover is beautiful. The story sounds suspenseful. Beautiful cover, I love how the red dress stands out so much to the neutral background! Story sounds like a great page turner! The cover is powerful and matches the action and mysterious packed synopsis. The cover is pretty and I like the title font. The synopsis is very intriguing. Sounds like a thrilling read.